Will 2018 Be a Safe Year for Canadian Air Travel? Wilfredo’s broad face smiles wide, and crinkles. It’s a smile with a hint of grimace, but it reassures regardless. We tread upwards as wind starts to whistle and pellets of ice snap and pop against our bodies. My pack’s straps dig warmly into the collarbone, comforting in their friction, its weight providing a break against mountain winds that seek to remind us where we are. Lungs are nicely straining, and one of the mountains’ great and ever-present lessons is reinforced: cooperate or perish. He is like a favoured child who can do no wrong, and he is entirely aware of it.The landmass to which Alex’s shrill worship is directed is up and just beyond the ridge-line, hovering in a shifting grey void of cloud and snow. Mount Salkantay (meaning “Wild” or “Savage” Mountain in the Quechua language of the Andean people) beckons us, and all which is around it seems to move and hum. The wind, the snow, our group—all is in motion. The pathway we follow is etched into rock, and one sees it more clearly when not looking directly at it. It is like a small line of light that hovers in the periphery. A part of the great roving web of routes that linked the ancient Andean world, it is drawing us inevitably closer to the articulated brilliance that is Machu Picchu, which rests just north of us. Here, as in the Himalayas—where so much also ran parallel—the spirit world, disparate kingdoms, economy and supply management along ancient routes, have always been inextricably linked and bound. One travels and arrives by grace, will, and reverence, if at all. Here in the heights, one pays tribute and works with the natural world. Here, reciprocity holds ultimate sway. Borders say we are in Peru, but so much of what is around us is of a very particular Andean world. Mountain kingdoms have long been informed by a different set of conditions and elements. Everything is immediate and impactful, little is taken for granted. There is a Quechua word that embraces this intimate mountain notion of reciprocity. “Ayni” is a philosophy that embodies the concept of living collaboratively—of mortals with nature, of people with each—and has very much been front and centre to me in the last days. It is not simply an archaic notion: it lives here in the Andes, as a central theme of daily life. Allegiances and fidelities in the mountains are linked to altitudes and ecologies, as much as they are about strategic gains or nationalities. Mountain worlds, in my slightly skewed frame of reference, are bound by a similar stewardship to spaces. One never forgets that Nature runs the whole production. Built by the kingdoms and cultures nesting along western South America (here, the ancient groups are called “cultures”), mostly along the spine of the Andes and the Pacific Coast and all the landscapes in between, to access, to source and finally to rule the region, the road’s seed routes compressed into a vast interweaving network over centuries. Though the Incas ruled here for just a century—their empire dating from 1438 to 1532—harnessing thousands of kilometres of pathways (astonishingly, an estimated 38,000 km; from present-day Argentina and Chile in the south to Colombia in the north) remains one of their great realizations, and legacies. 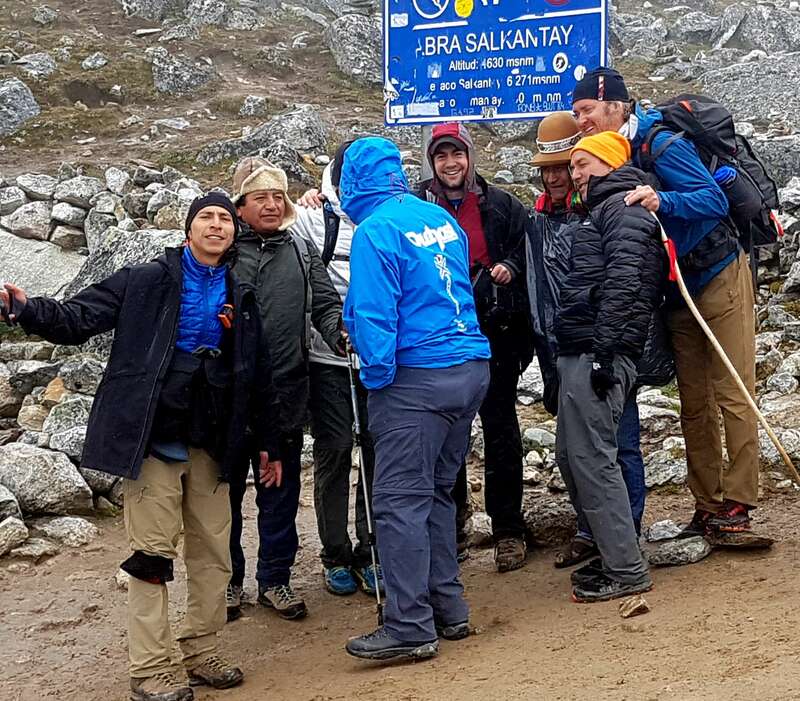 What more appropriate a group for this most diverse and iconic route than our little band comprised of mountain-runner, anthropologist-guide, juggernaut cameramen (one an Andean rock climber), Shaman, expeditioner/field producer, llamas, and my own tea-addicted self. Jackie, our local fixer and field guide, is a refined driving force, pushing us along seamlessly, harnessing our energy to see what’s possible. He’d moved back to Peru after years abroad, and his enthusiasm for home spilt effortlessly and endlessly into conversation as we trek. Wilfredo is as earthly a representation as I could ever hope for of Pachamama—the all-seeing Goddess Mother Earth of Andean culture. He is a constant reminder of the spirit world of the mountains of which I am so familiar, having lived long in the Himalayas, and of the reverence Nature herself demands. Domingo, our local logistician, who derives joy from ultramarathons and mountain trail running—preferably every day, and anywhere—was pure adrenaline, and decency. And, I come to think, a modern incarnation of a chasquis—the famed Inca messenger-runners who relayed information from the seat of power in Cusco across the empire’s swath of territory; formidable athletes, zigzagging through Andean mountain and even Amazon jungle trails, roads and corridors, literally over thousands of kilometres. I come to see how thoroughly Andean is Domingo, thriving in these mountain spaces. 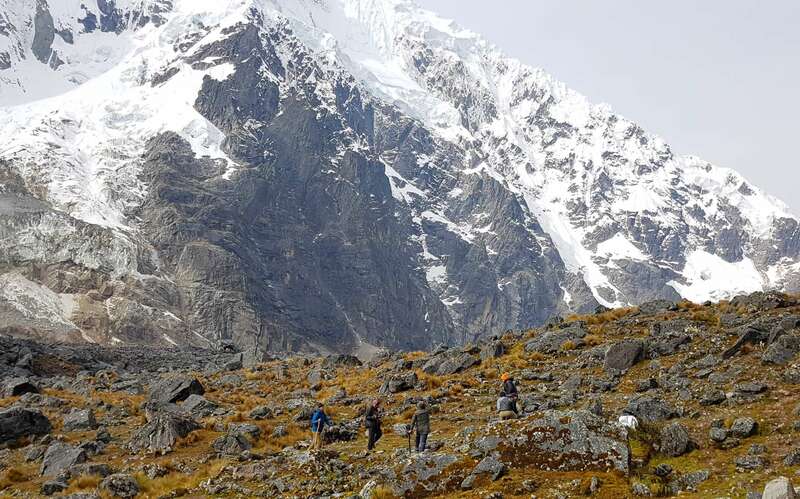 As we trek, Salkantay and its gilded ice and ominous lines come into sharp focus, but only in temporary layers, between sheets of blowing cloud. My jaws have been busy on this journey chewing coca madly, and not because I need it. There is simple joy in the slow heat that zings into the ears, slight elevation in pulse, and sense of camaraderie with all things. Our indispensable fixer Jackie, who lives in Cusco, is a connoisseur of coca too, and, just as vitally, of the time needed to partake in it. Coca—like my own bitter leafy tonic, tea—is part fuel and part ritual. This thinking entirely works for me. 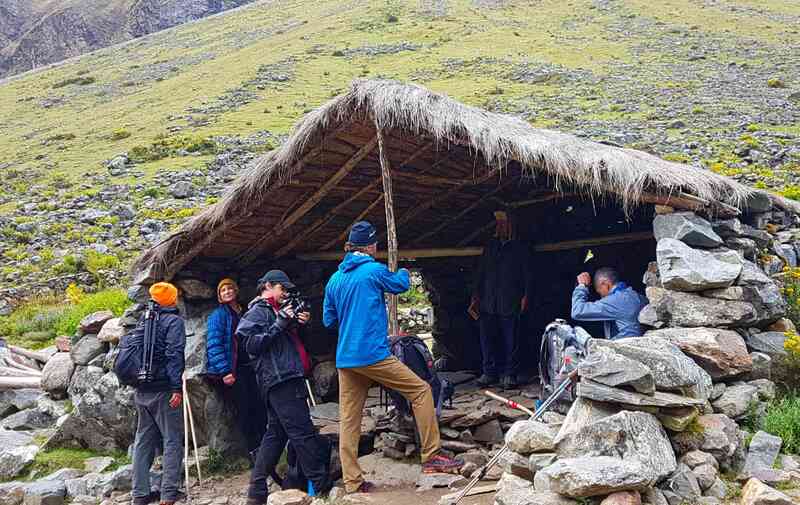 Nowhere is the tribute of coca more powerful than during my introduction to the ritual of k’into, a ceremonial offering of three dried leaves of coca that we are to do just below Mount Salkantay. 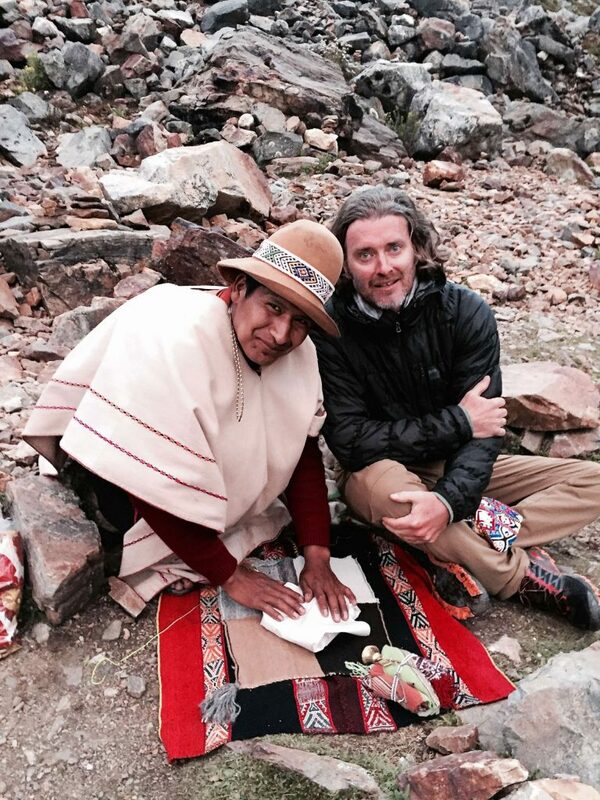 Here, in a wind-sheltered spot next to a small lake, our Shaman Benjamin squats down and gently unpacks a tiny wool towel, immaculately rolled. In plastic sandals, he travels in a way that shames almost everything modern and considered. His attire tells of minimalism, and function, that vanity has never touched. The need for interaction in the highlands necessitates an awareness, indeed an absolute requirement, of cooperation. When the Incas, centered in and around Cusco and the dominant culture in the region, began expanding their territory and conquering in the early 1400s, they constructed two vital north-south arteries and connected them to the plethora of trails, pathways and bridges already existing in the region. (And in so doing created the Qhapaq Ñan network.) Some of these incorporated routes dated from 2,000 years before the Incas ruled. K’into ultimately carves the great road’s meaning into me. Benjamin reaches into his small woolen satchel and carefully selects three intact leaves. He hands me the leaves and finds another three for himself. Light, and any pretentions of warmth, are being eaten up by mountain cold, which emanates both from the sky and the earth as winds die and seem to make way for night. Laying out ornaments and coloured wool upon a rock, he begins a soft sermon that is lost almost immediately in the amassing blue air. 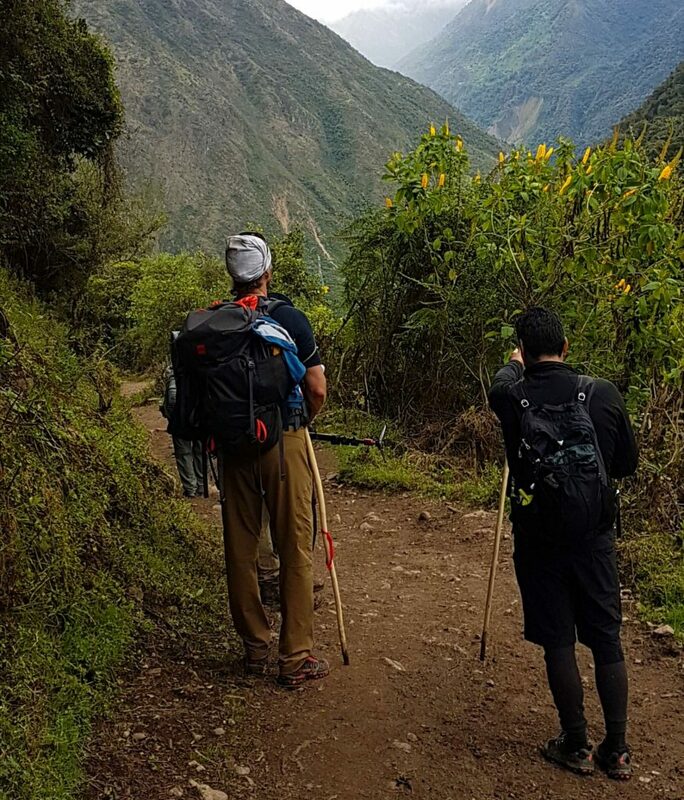 He blows on the trident of leaves, and directs an extra tribute to the Apus (mountain spirit) of Salkantay and a large bow to Pachamama, whose presence would dominate and define our trek and our experience. Then he smiles at me, indicating I should do likewise. He stands watching, and in that little moment, within the blue-aired space, in the ebbing wind, it feels as if we are suddenly standing in a vacuum of time. Whether I feel interconnected with any universe I don’t know, but I do feel a gut comfort and warmth, and that our homage is entirely appropriate. When I attempt to shove the coca leaves into my mouth for a little “freshen up,” Benjamin admonishes me and quickly takes the leaves and tucks them under a stone. These will not be chomped on, they are for the mountain. Beside me Jackie is still, and even the raging force that is Alex has calmed, though his eyes glow. Impromptu concert: at a rest hut along route, Wilfredo takes out his pan flute! Here, offerings are serious and intentional things. 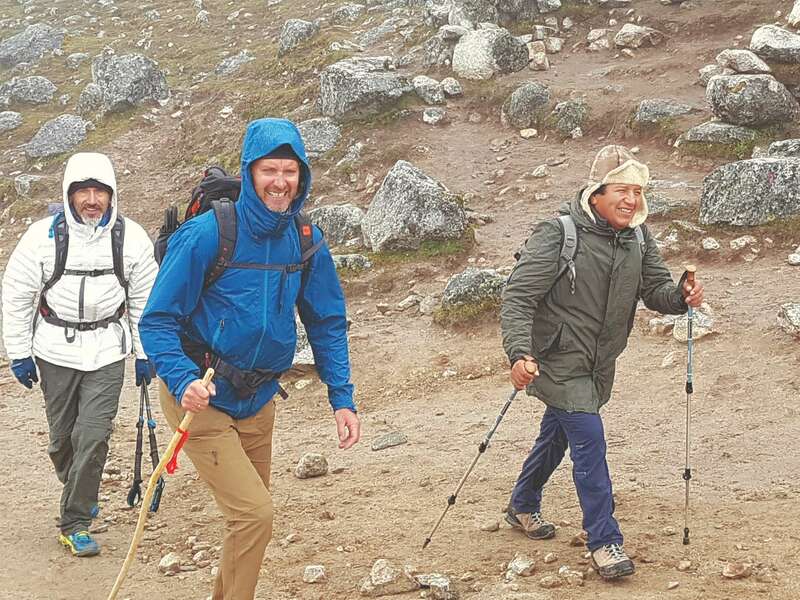 Rains had bludgeoned us, seeping in and testing all resolve, as we trekked up and across the valley floor, through cloud-forest and down to just within reach of the Amazon Rainforest itself, and up again to Andean foothill passes with their spectacular views. Rain, more than any snow, sun or wind, is the element that can demoralize in record time. Its power is to relentlessly wrap everything in its cloak, then choke—even as it feeds. Machu Picchu’s eternal grace has inspired me. Its crowds could be detested, but even amid them there’s a deep-belly feeling that somehow atop that mountain, humans had gotten something entirely right. It is almost as if when the Incas built this golden retreat they were mastering geography itself. 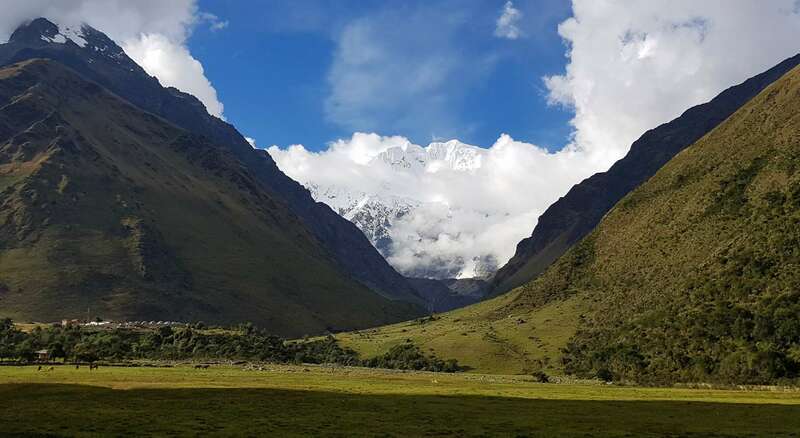 We had arrived after our five-day trek through the valley of the Cordillera Vilcabamba—and in the shadow of magnificent, glaciated Mount Salkantay—that had seen us tenting on borrowed land near lodges under spectacular Andean sky. We had sat, taken tea, and looked in wonder at the almost clinical precision of the situated peaks. We had integrated into the Andean spaces around us, and into each other’s personalities. Bad company can muddle even the most incredible geographies; good company enhances every second of a journey. We had the latter. Jeff Fuchs is Outpost’s Editor-at-Large for Asia. He lived in the Himalayas for almost two decades and led Outpost across Peru’s Andean valleys and highlands. Read Part 2 of In The Land of Ayni: The Chawaytiri Weavers of Peru’s Sacred Valley. 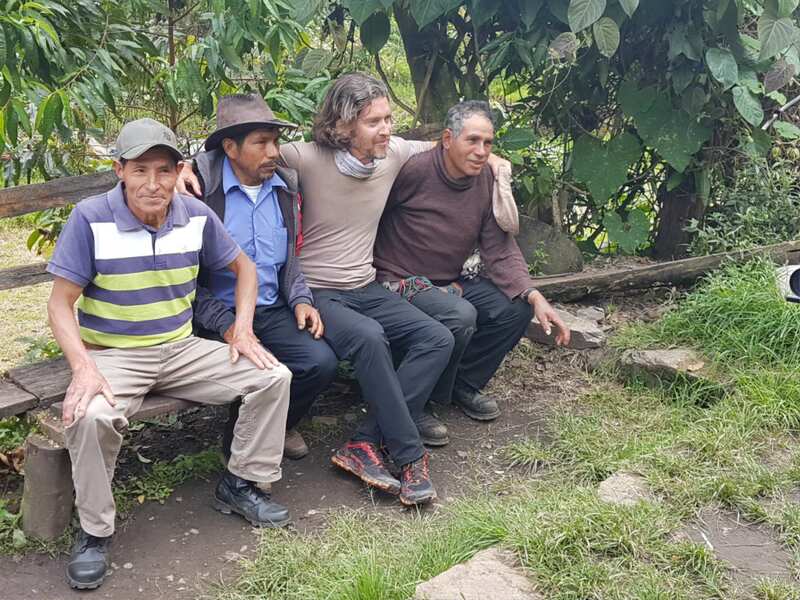 A whopping thanks to our Peru project partner, Mountain Lodges of Peru, whose services and people were absolutely fabulous! Jeff Fuchs is Outpost’s longtime editor-at-large in Asia. He's an explorer. Himalayan expeditioner, anthropologist, writer, photographer, Explorers Club member (both New York and Toronto), lecturer at the Royal Geographic Society and Scholar in Residence of the East-West Center in Honolulu. An expert in mountain cultures and ancient trade routes, Fuchs is the acclaimed author of The Ancient Tea Horse Road: Travels with the Last of the Himalayan Muleteers. When Visiting a New Culture, How Do I Keep from Offending Locals?